Dubai, UAE (May 23, 2012) – Ramada Downtown Dubai, located in Dubai’s most prestigious and vibrant district, recently hosted a fashion show launching the Reewaj Collection from designer Sadia Ahmed Mughal. The successful event featured the latest collection of casual and formal wear from the designer who loves to combine different colours and cuts to create designs that suit the taste of their growing clientele in the UAE. 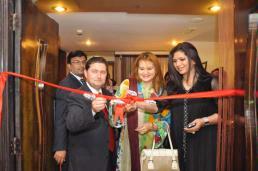 Sadia and her sister Ayesha started the business in 2010 and opened their flagship store Al Yazan, located in Sharjah. “We always wanted to promote Pakistani fabric, colour patterns, and different types of embroidery from different areas of Pakistan. With the help of some Pakistani designers and our cuts, our clothes are really becoming popular not only in this part of the world but across the globe,” said Sadia. The team attributes their success to their mother who is the real hand behind the designs. “Being bankers by profession, we couldn’t travel to Pakistan for embroidery and buying fabric. The credit goes to her for understanding our ideas and converting them into the designs we want. She takes care of all the work for us in Pakistan, from selecting the right fabric to dying and embroidery. Ramada Downtown Dubai is located in Dubai’s prime district – Downtown Dubai, adjacent to the world’s tallest building, the Burj Khalifa, the world’s largest shopping destination, The Dubai Mall as also with great views on Dubai Fountain. Offering large, comfortable and well appointed suites, it boasts one of the best views of Burj Khalifa up close and is fast becoming the most recognized name in Dubai’s hospitality sector. It provides guests a uniquely exciting experience of inner-city Suite living combined with all the facilities and services of a first-class hotel and is a true ‘home away from home.’ Featuring a gymnasium, a large outdoor pool, meeting rooms, business centre, overlooking Burj Khalifa and Dubai Mall as well as the Dubai Fountain, the property offers guests a luxurious and an extensive range of possibilities in the heart of Dubai. With a full range of support services one can stay stress free on top of work commitments and enjoy the tranquillity of the property. Next door, a short stroll away you find branded convenient store and pharmacy. As an alcohol-free hotel with a number of innovative products and services, Ramada Downtown Dubai is an ideal destination for either a short break or an extended family holiday for all GCC families and discerning corporate and leisure travellers.